So, several of y’all had more questions about the embroidery in this picture (previous post about the geometric chain stitch design). First, about the scale: The inner core of the design (consisting of the 4×4 block of squares) is 7 inches/17.8 cm across. So each small square outlined in orange is around 1.75 inches/4.4 cm inches across. I should mention though, they are not actually exactly square or exactly the same size – I think the original embroiderer just drew it by hand without bothering with a ruler. The entire cushion front (including the blue that you see at the edges of the photo) is 16 inches/40.6 cm across. Secondly, someone asked about patterns. I don’t have any charts or outline designs, and couldn’t find any online or even any books on the topic (doesn’t mean they aren’t out there!) However, here is a gallery of traditional Hmong motifs for textiles worked in various techniques from UC Irvine. It’s a great source of inspiration for geometric designs. 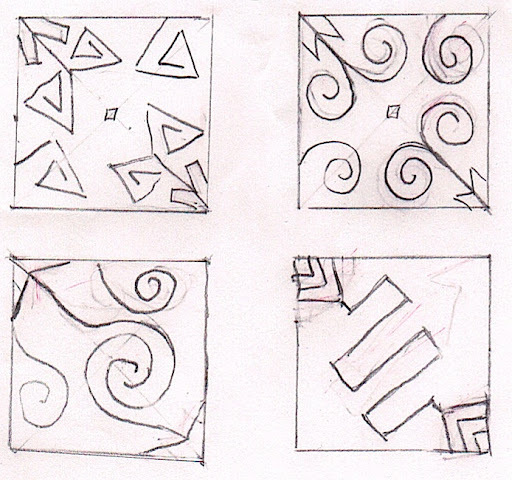 Also, I did some very rough sketches this morning – you really only have to draw one square. The rest of the design is just repetition. One is based on the design in the photo, the others are just playing around with ideas. Anyway, if y’all end up doing some embroidery with this, I’d love to see photos! This entry was posted in Embroidery around the world and tagged chain stitch, embroidery, geometric design, hmong. Bookmark the permalink.